If getting up and down from a sofa or chair is not as simple as it used to be for your loved one, buying a power lift chair may be the right move. For those who have difficulty standing from a seated position, lift chairs are a terrific aid, increasing independence, safety, comfort, and convenience. There are so many options, both in stores and online, when it comes to buying mobility equipment that it can become overwhelming. Before deciding on a particular model, it’s important to assess your wants and needs. Answer the questions below to help you decide on the options that will be most beneficial in your lift chair. Have a sense of the room size and décor for an appropriate match. Do you have a fairly tight area in your living room to place the chair? Does it need to be against a wall? Models are available that can start against a wall and slide open forward without banging into the wall behind it. Standard models which both slide out and backwards may be a problem in tight areas. What size will you need based on the user’s height and weight? Just like any recliner, you want the chair to fit your body size. This is very important because the larger the chair, the deeper the seat cushion. Choose a chair that’s too big and your legs may not touch the floor when sitting straight up. Choose a model that’s too small and your lower back area might not respond well. 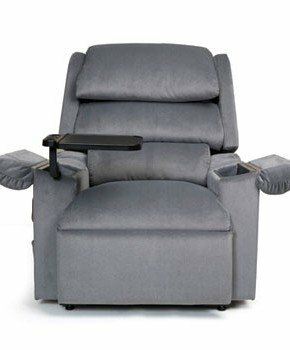 Along with the power lift feature, lift chairs are available in three reclining configurations that operate via the remote hand control. 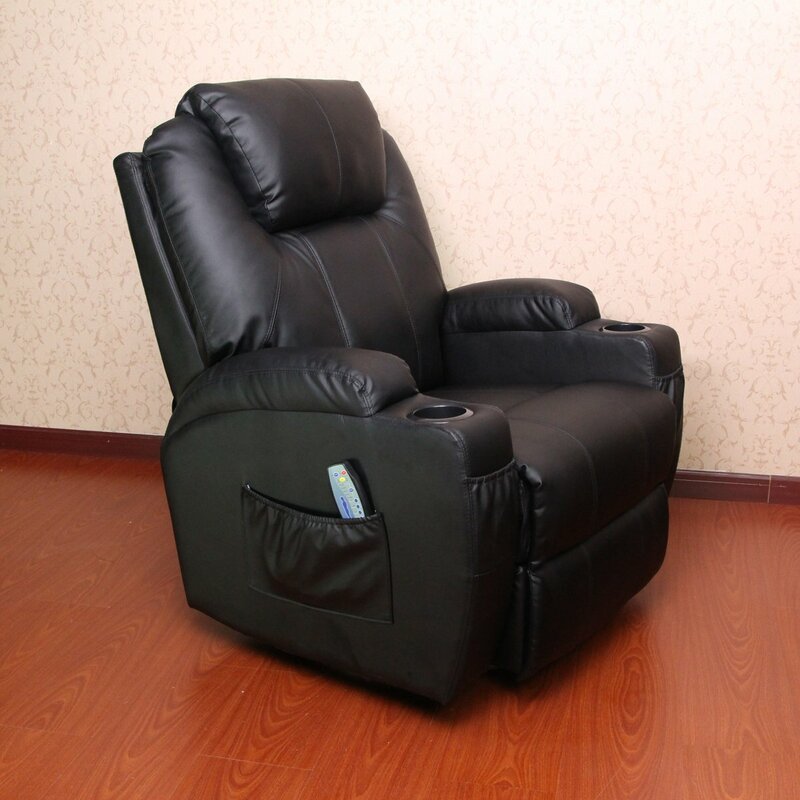 Lift chairs are differentiated by the degree of recline they can reach, recline mechanism and position of the footrest. There are three different types of lift chairs: two-position, three-position and infinite position. 2 Position Lift Chairs – Offer a limited reclining backrest with an elevating ottoman, designed for increased comfort These chairs have a reclining range of 45 degrees. For many, this is a comfortable position for reading and watching TV. 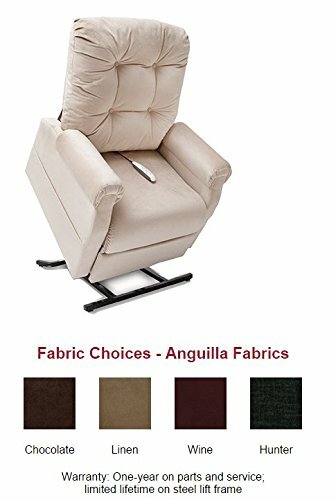 3 Position Lift Chairs – Offer an extended reclining backrest that can be positioned in a number of recline angles, and with an ottoman, ideal for those seeking a bit more recline when watching television or relaxing. These chairs can recline to an almost flat position and can stop at any degree of recline in between. 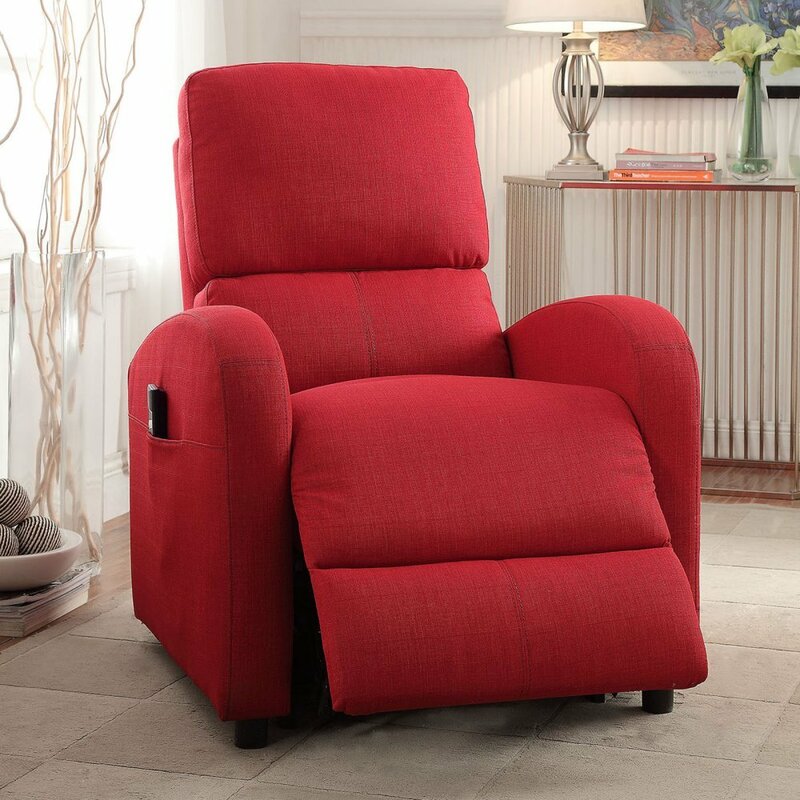 With an ottoman, it is possible to nap comfortably in this chair, as well as read and watch TV. Infinite Position Lift Chairs – Also known as zero-gravity or full recline chairs, these chairs offer a full range of recline, all the way to a true sleeping position, with independently elevating ottoman for optimal comfort. They can recline into a completely flat position (where the backrest is parallel to the floor) and everything in between. Some models can also lift a person’s feet above his/her head into the Trendelenburg position or lift a person’s feet above their heart into the zero-gravity position. Heavy Duty/XXL – For users needing a 4″ wider seat, with a weight capacity of 600 lbs. to 700 lbs. This Golden Technologies Elite Comforter Extra Wide Series Lift Chair Golden Technologies recognizes that “One size does not fit all”. Backrest — There are many different options for backrests such as button back, pillow back and split back. The difference between the different backrest styles is mainly the look and what fits the décor of the home better. Button back (commonly seen in chairs and couches, where buttons are sewn into the backrest at regular intervals creating a depression) tends to be firmer and pillow back is usually the most plush. Most other backrest styles fall in between those two when it comes to plushness. Controls — Most lift chairs have a hand control on the right of the chair, near the armrests. Simple hand controls only have an up and a down button. The hand control requires constant pressure so if the “up” button is held down, then the chair will go from recline to a seated position and eventually a lift position, where the user’s feet will be on the ground and he/she can stand up from the chair. Additional options such as heat and massage will also be controlled by the hand control. Some lift chairs can be programmed to remember the user’s preferred position for watching TV or napping and will move to that position with a simple touch of a button. What additional options may be beneficial to you? Do you sweat a lot? Leather may not be the best choice. Is incontinence a problem? Perhaps material made of cloth does not make sense in this case. In most cases, leather will cost more, but do not discount its benefits. 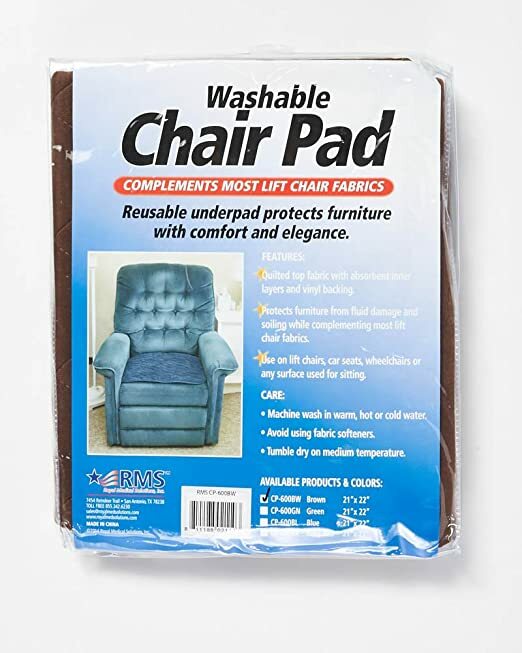 This RMS Absorbent Washable Reusable Incontinence Chair Seat Protector Pad is great to protect your chairs and other furniture. A magazine pocket is convenient. 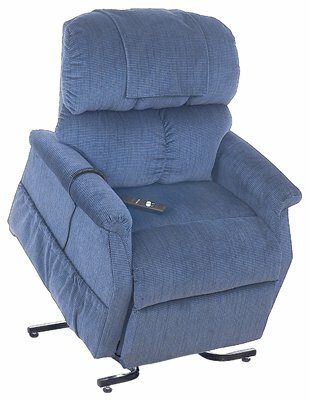 This Catnapper Somerset 4817 Power Lift Chair and Recliner below has a generous magazine pocket. 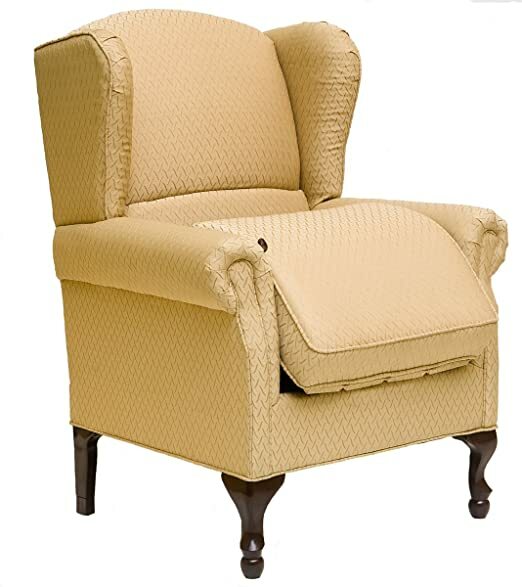 Another nice feature: this Golden Technologies Regal Lift Chair has a built-in tray and cup holder. Beyond selecting the lift chair’s features, size, and options, it’s also important to consider the room where it will be placed. Lift chairs are the approximate size of comparable recliners; however, because lift chairs activate, they can require a bit more space. Nevertheless, for rooms with limited space, an option is a wall-hugger or space-saver model, which allows the lift chair to operate within 4″ to 6″ from a wall. 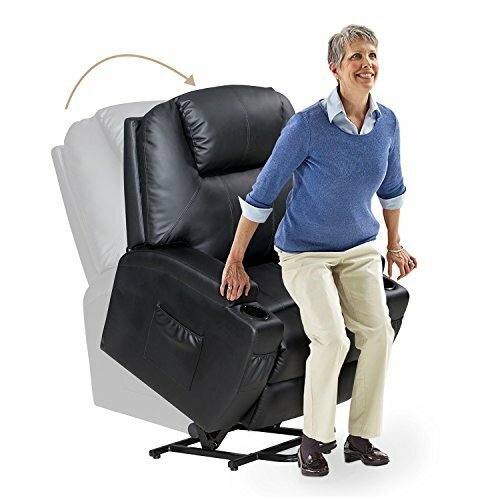 The video above shows the 5600 Series Wall-a-Way Reclining Lift Chair from Medi-Lift, which is a great example of a wall-hugger or space-saver model. 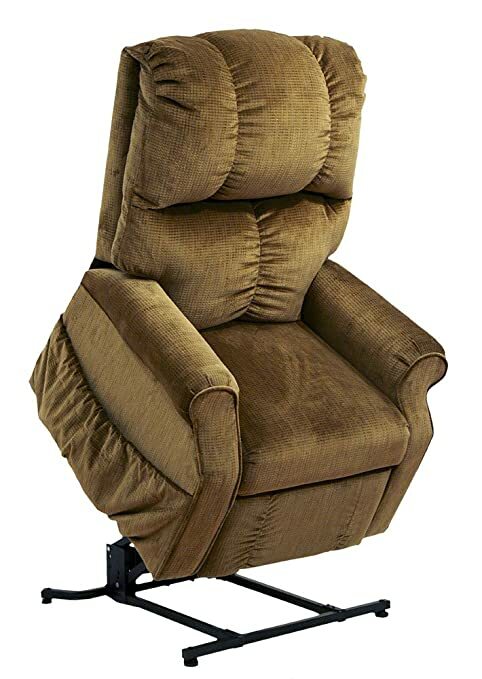 Of course, décor is important to many lift chair users, and with the wide variety of fabric choices on many lift chair models, it’s possible to closely match a lift chair to most existing furniture colors. Reclining Lift chairs are not only made to fit all people, but they are created to fit in with any décor as well as any lifestyle. Lift Chair fabrics offer plentiful options. Even beyond colors to fit your taste, there are fabric options that fit to your lifestyle and can weather the wear and tear of nearly any situation. There is high-quality micro-suede, which is a man-made knit blend of polyester fibers almost a hundred times finer than human hair. While very similar to normal suede, Micro-Suede is softer and easier to clean. As a furniture upholstery, it is very durable and resistant to dirt and is easily cleaned by wiping the fabric with a dry cloth. Ultraleather, is another popular option. This material offers the look and feel of leather, but is more durable than genuine, hide upholstery. With a durability rating 13 times the industry standard for heavy-duty fabrics and with built-in stain resistance, this water-repellent polyurethane upholstery is built to last. Most stains can be removed from an Ultraleather lift chair with the use of water, soap, and/or common alcohol-based cleaning solutions. Ultraleather is also highly resistant to temperature changes, remaining cool to the touch even when exposed to direct sunlight and resisting the stiffening and cracking of normal leather in cold weather. Yet another more affordable fabric choice is vinyl, which is a plastic resin made from chlorine and ethylene. It is non-breathable, which allows it to absorb and contain heat. Regularly inspect all wiring harnesses for damage, frays or signs of corrosion. Unplug the chair and contact your manufacturer’s local authorized dealer for service. Regularly inspect the fabric for rips, tears or pulls. Always refer to your owner’s manual for specific information regarding cleaning and maintenance. Cleaning — a mild fabric cleaner may be used on fabric covered lift chairs but do not allow any liquids to come into contact with any electrical components. 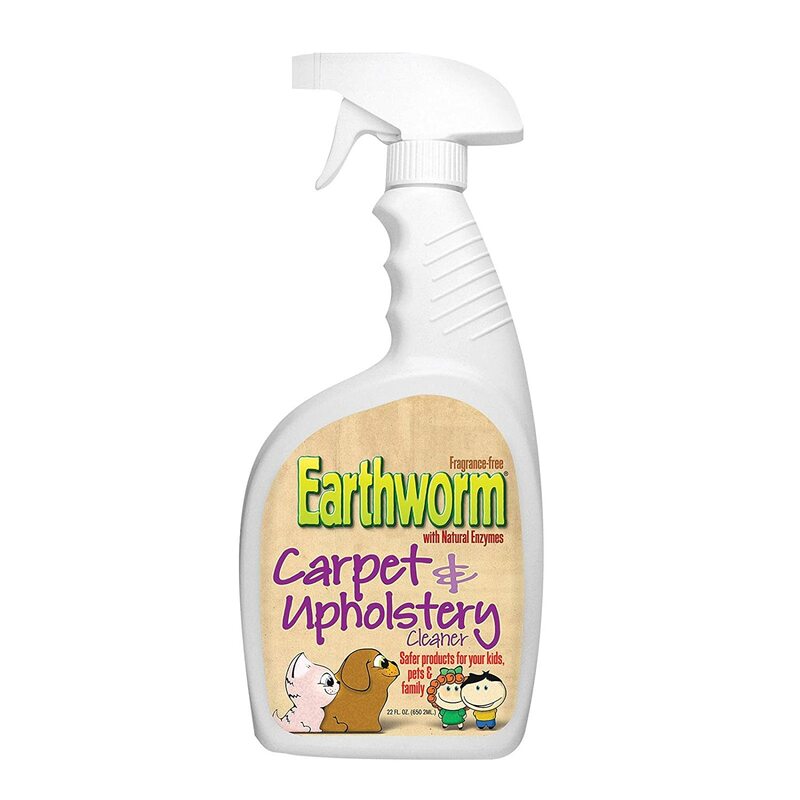 I like Earthworm Carpet and Upholstery Cleaner (made with natural enzymes). Remember to always unplug the chair before cleaning. Read the owner’s manual to ensure that the cleaning products you plan to use will not damage the fabric or upholstery. 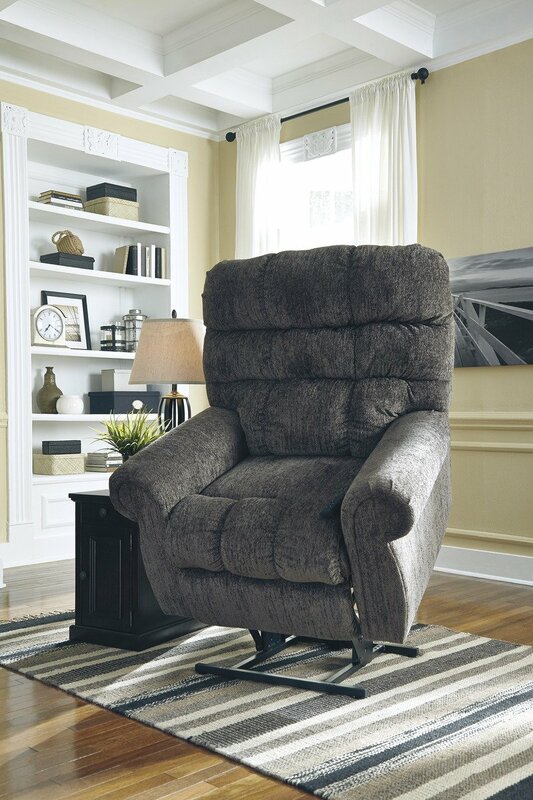 From function to style, a lift chair will surely be a welcome addition to your home. Thanks for visiting and reading … I hope this article provided you some helpful ideas. I welcome your comments below. My grandmother has one of these chairs and I really had no idea how many choices there were and how many options were available. I just thought you got one chair and it came in various colors. But it makes sense now that if the person has incontinence issues to not have cloth chairs and they may want a chair that the legs lift up when they are sitting down to be in a position of more comfort for them. I appreciate your comment. Leather is best for incontinence issues, for sure. Vinyl is a less expensive optionas well. If someone develops incontinence after they have already purchased a cloth chair, it’s a simple matter to use disposable or washable incontinence pads on the chair seat. My mother had to use one of these chairs, I think it was one of those Infinite Position Lift Chairs. She had a stroke and was paralyzed on her entire right side, and she was a large person. It finally got too difficult for her to get in and out of a regular chair so she got one of these. She even slept in it every night because if was more comfortable for her than a bed. She lived with the paralysis for more than 25 years and I’m fairly sure she used her chair for at least 15 of them. Thank you so much for your comment, Leslie. I love posting about products which really make a difference for people. When my mother was ill, she needed a lot of help getting into and out of chairs and beds. It’s always a good thing when independence can be enhanced.